Mercury (Hg) is a naturally occurring metal found throughout the environment. It is a liquid at room temperature, combines easily with other metals and expands and contracts evenly with temperature changes. Because of these properties, mercury has been used in many household, medical and industrial products. Although mercury performs many useful functions in our workplaces and homes, it is toxic and can impair our health. Mercury is a potent neurotoxin, meaning that it interferes with the way nerve cells function. Utah routinely samples waterbodies throughout the state for mercury and when high concentrations are found, advisories are issued for the specific species affected. However, although advisories exist, it is important to understand that not all waterbodies in the state have been tested and that further testing may result in additional advisories being issued. Mercury poisoning causes a decreased ability to see, hear, talk and walk. It can cause personality changes, depression, irritability, nervousness, and the inability to concentrate. It can also cause damage to the brain, kidneys, and lungs. Mercury is a particularly serious problem for pregnant women and children. Fetuses and young children suffer the greatest risk because their nervous systems are still developing. They are four to five times more sensitive to mercury than adults. Mercury may enter the environment during the life cycle of a range of consumer, medical and industrial products. The largest use of mercury is in electrical products such as fluorescent lamps, thermometers, thermostats and electrical switches. These products are found in residences, office, commercial and industrial buildings and cars. Other mercury-containing products containing mercury include pressure sensing devices, blood pressure reading devices, thermometers and dental amalgams. The following list itemizes additional products that have been known to contain mercury. Although most of these products are no longer manufactured with mercury, older items containing mercury may still be in circulation. Cumulatively, these products may represent a significant reservoir of the toxin that can potentially enter the environment. Mercury can become a part of the global mercury cycle when mercury-containing products are broken and the spilled mercury poured down the drain, or when these products are disposed of in landfill sites. Mercury releases from products, as they break down in both active and closed landfills, may represent a significant pathway for the transport and eventual deposition of the toxin in various terrestrial and aquatic ecosystems. In general, mercury may be released from municipal solid waste landfills as a trace component of landfill gas, which is generated during the decomposition of waste under anaerobic conditions, or in the liquid leachate flowing from the site. Because the improper disposal of mercury-containing products can lead to environmental and health effects, it is important that individuals reduce their consumption of these products and dispose of them properly. Mercury is a naturally occurring element that is found in air, water and soil. Mercury originates in the earth’s crust. It is released into the environment from volcanic activity, weathering of rocks and as a result of human activity. Why should I care about mercury? People are mainly exposed to mercury in its methylated form when they eat fish and shellfish that contain the compound. Waterfowl also bioaccumulate mercury in their tissues and have the potential to pose a health risk when consumed. Which waters are tested for mercury? 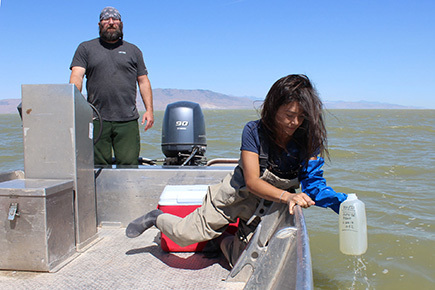 Utah has been sampling fish tissue for mercury analysis since 2005 to determine locations where fish have high methylmercury concentrations. The Division of Water Quality partners with Division of Wildlife Resources and Department of Health for issuing fish consumption advisories where appropriate. DWQ is currently working on importing mercury fish tissue data into our public database, AWQMS. In the meantime, data is available via email request to Amy Dickey. Visit DWQ’s Water Quality Data homepage for more information.